Then ... They are on McDowell Avenue passing under the section of Highway 101 that traverses the Presidio the red marker on this map). Is that a chimney stack in front of the building behind them? ... in 2003 ... the junction looked very similar as recently as 2003 except for changes to the base of the highway pillars but the building and the stack, if that's what it was, are no longer there. 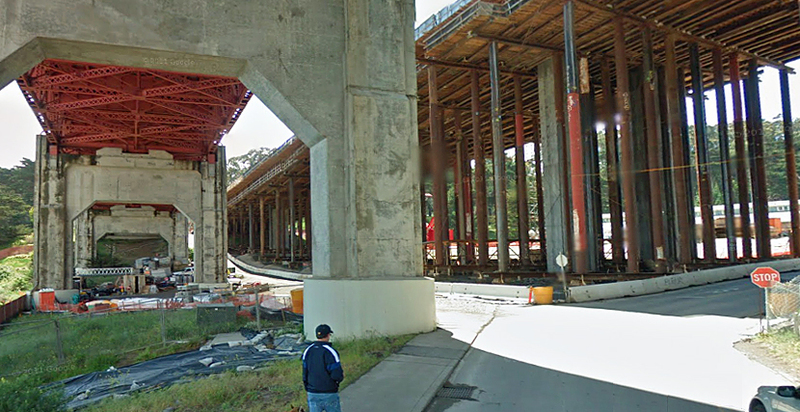 ... and Now, In this recent photo we see great change as a new section of Highway 101takes shape. The section of freeway on the left is slated to be retained but rebuilt. Then ... Next they turn into Long Avenue about to head up the hill to Lincoln Boulevard. ... and Now , viewed from what is now a parking lot the double-gabled building is still there. Then ... 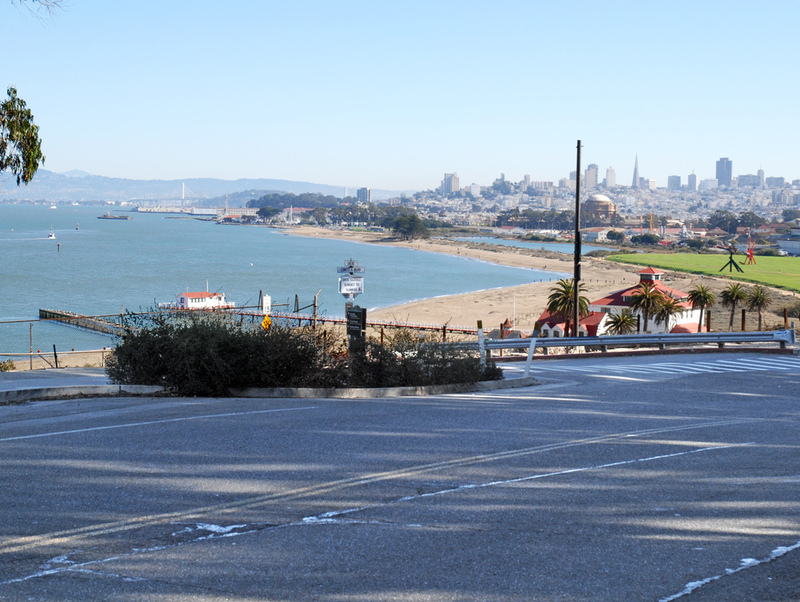 Here they have turned onto Lincoln Boulevard and are approaching the Golden Gate Bridge (the blue marker on this map). This is the same spot where Irene drove by earlier on her way to her apartment. Then ... Finally Parry turns onto a service road alongside the bridge. ... and Now , the recent bridge view shows the service road running alongside the bridge to a bluff overlooking Fort Point (map). They stop at that bluff and Parry manages to grab the gun. The classic shot, below, with the young Golden Gate Bridge as background (it was only 11 years old at that time) anticipated by a decade Alfred Hitchcock's use of the same location in Vertigo. Then ... A struggle ensues and Parry holds himself back as Baker falls over the edge to his demise. ... and Now , the rocky bluff as viewed from the parking lot at Fort Point. ... on location 1 ... Baker, Parry and crew rehearsing the climactic struggle. ... on location 2 ... Hangers-on join the crew for this impromptu snapshot on the bluff.